Advertising can be pretty intrusive these days, but if Massachusetts-based Nuance has anything to say about it, things are going to get much, much worse. The company has designed a new type of mobile advertisement called Voice Ads that listens to and responds to your voice, creating a commercial that essentially pretends to have a conversation with you. A video from the company behind the technology hints at how the new ads might work. 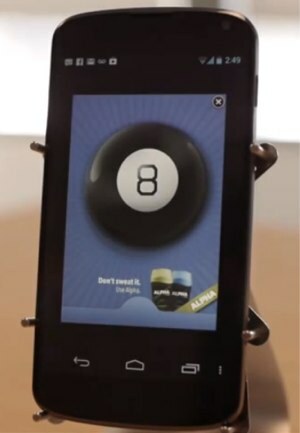 After touching a banner ad for a Magic 8-ball, an application capable of understanding voice input launches. The hypothetical ad requests you ask the 8-ball a question, and after you do, the ad answers it. “You should definitely buy it,” says the Magic 8-ball app, responding to a question from Nuance Advertising VP Mike McSherry asking if he should buy an engagement ring. “And while you’re at it, use (fictional deodorant) Alpha! Smells like money in the bank,” the advertisement continues. Nuance’s Voice Ads aren’t currently live, but the company has partnered with a number of huge names in the advertising industry. So while the Internet’s version of the door-to-door salesman isn’t quite here yet, he’s on his way.